According to Ayurveda joint pain is known as Sandhigata vata. With increase in age vata dosha is predominant in human body that is why with aging disease caused by vata dosha increases in body. Joint pain is a common symptom with many possible causes. Joint Pain and Arthritis are the one of the most devastating conditions faced by individuals, particularly elderly women today. When there is pure Vata dosha involvement (a pain without swelling or discoloration) then the massage with medicated ayurvedic oil is quite useful & supplement is helpful in balancing bodily humors “vata”, which is responsible dosha for Sandhigata vata. Osteoarthritis, Sprains, Fracture or injury, Septic Arthritis, Tendonitis, Autoimmune diseases such as: Rheumatoid Arthritis, Lupus, Bursitis, Chondromalacia Patellae, Gout, Osteomyelitis. Ayurvedic Experts formulated and tested to treat root cause of Arthritis pain, Joint pain, and Back pain. Relieves pain & inflammation, Nourishes Joint Cartilage. Corrects ‘vata’ dosha & increases mobility & flexibility. For all ages of men, women. Treatment Includes: Oral Supplement capsules & joint care oil. 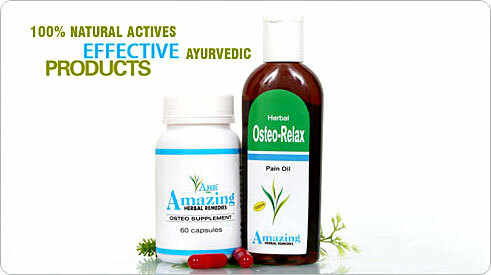 Herbal care India & natural herbal remedies are that they are safe, without side-effects and effective. Our herbal products are made from Himalaya herbs India, ayurvedic herbs providing natural, alternative care and herbal medicines. Our herbal medicine company is among the leading companies engaged in marketing of health food supplements in India. Our herbal supplements ayurvedic herbs are frequently used in Ayurvedic system of medicine since 5,000 B.C. Our range comprises of gastro powder, fat & inch loss burners, skin care supplement, hair care supplement, hair thickener supplement, grey hair supplement, arthritis & joint care supplement, memory loss care, vigour & vitality supplement and anti-depressant supplement. Herbal joint care supplement has its roots in Ayurveda-ancient herbal healthcare system of India. Herbal powder is a researched ayurvedic natural product, developed by certified herbalist Dr. Raksha, using nature’s most powerful ingredients that have been scientifically proven for Joint & Muscle Excellence, and has no side effects. Herbal and Natural Medicines contains specific nutrients that are not easily obtained from dietary sources alone that influence on joint care, as deficiencies of specific nutrients can also lead to Arthritic Pain. Herbal pain defy provides deep relief in Osteo-arthritis, Rheumatic Disorders, Pain in Joints, back-ache Inflammation, swelling and Muscular Pain, sprain & Strains etc. Ayurvedic medicine made from natural herbs helps to relief from joint pains, knee pains, helps to control arthiritis and spondilitis, helps to maintain healthy bone joints. Herbal supplement provides relief for Sciatica, Stiffness, Stiff Necks, Frozen Shoulders, Back ache. Intake: Consume 2 capsule (500 mg) twice a day after meals with milk or any flavored milk. Ayurveda is very effective when prescribed with emphasis on the right food & living habits. Nirgundi (Vitex Negundo): Nirgundi is also well known vata – shamak, nervine tonic and alleviates swelling. Malkangni (Cilastrus Paniculata): Known vat shamak, anti-inflammatory, muscular pain reliever. Sudg guggal (Commiphora Mukul): Since ancient time it is used for Rehumatic Sloranis. Also has anti-inflammatory & antiseptic properties. Jaiphal (Myristica Fragrans), Nagarmotha (Cyperus Scariozus), Sonth (Zingiber Officinale), Punarnava (Boehavia Diffusa), Khurasani Ajawain (Hyoscyamus Niger). Our Herbal medicine company which specializes in Ayurvedic Herbal health care products and medicines, have been successful in tapping the incredible benefits of ayurveda in the form of natural, alternative care and herbal remedies. Our health care products are made from natural, healthy herbs. There is a wealth of alternative, holistic and complementary medical approaches to diagnosis and treatment of Muscular & Joint Pains. Dr. Raksha created authentic herbal formulations according to Ayurvedic texts & involved in the natural / herbal products industry as a medical researcher and health consultant. Herbal Joint care oil is a blend of rare Indian natural herbs, which are used from centuries to provide the necessary strength to joints and muscles. Herbal Oil is effective pain reliever, fast acting and long lasting with blend of natural oils that provides rapid trans dermal penetration so gives quick relief from the pain as well as reduces stiffness in joints and muscles and removes ache. Herbal medicine made of natural herbs is effective pain reliever, fast acting and long lasting with blend of natural oils that provides rapid trans dermal penetration which provides warm effect & helps in quick relief from the pain as well as reduces stiffness in joints and muscles and removes ache. Ayurvedic medicine made from natural herbs is really helpful for those who have pain in body like Muscular & Joint Pains, Sprains & Strains, Cervical & Spondylitis, Back Pain, Rheumatism, Arthritis, Sciatica, Stiffness, Stiff Necks, Frozen Shoulders, Back ache, Muscular Sprains and Spasm. More than just a herbal joint pain remedies; it’s a powerful all natural alternative to modern Pain Relief treatment products. Message the Herbal Oil (2-3ml) gently on the affected area until herbal medicine is completely penetrated into the skin. Apply it twice a day. Erand (Ricinus Communis): Erand is a well known vata- sahamak, anti inflammatory, pain reliever. Highly effective for backaches, muscular sprains & joint pains. Used in lip balms, muscles & joint rub. Malkangni (Cilastrus Paniculata): Known vat shamak , anti-inflammatory, muscular pain reliever. Vajrasan, Pawan Mukat asan, Uttanpad asan, Surya namaskar, Sarap asan, Bhujang asan, Padam asan, Trikonasan, Tar asan, Kati chakra asan, Aulom Vilom pranayam (all covered in earlier articles) are very useful. Benefits: It helps in gas trouble, fat loss and help to release excess of Vata from body, tone up skin. When a person having joints pain try to avoid the heavy food and junk food which is difficult to digest, according to ayurveda in our body all moment caused by the influence of vata, during the joints pain vata in our body is imbalanced due to which we are having pain and movement are restricted. Foods to eat include green vegetables such as kale, okra, celery, parsley or watercress, seaweeds, carrots, barley and wheat grass products, avocados, pecans, soy products, whole grains, spirulina and cold water fish such as salmon, sardines or herring. Fruits and vegetables are a highly recommended part of a diet for joint pain. They are known to help reduce inflammation in muscles and joints. Brightly colored fruits and vegetables are the best for reducing inflammation and reducing pain. Examples of these would be tomatoes, bell peppers, all berries, carrots, bananas, apples and melons. All of these foods are packed with flavenoids, along with other important anti-oxidants that are very helpful in fighting inflammation. Anti-oxidants are also known to help repair damage to cells and tissue. They are building blocks for stronger cartilage, tendons and ligaments. There are certain foods that have been found to increase joint pain and inflammation and should be avoided. Joints, tendons and ligaments are primarily made up of protein collagen, which is needed for healthy muscles and joints. The foods you eat can either break down the collagen or help to rebuild it. High-carbohydrate foods are known to increase joint pain and inflammation because they destroy collagen rather than build it. High-carbohydrate foods and refined sugars also cause damage to collagen. Examples of these foods are white bread, white potatoes, sweets, sodas, candy and chips. These foods have the ability to increase the inflammation in your joints, which will then increase the chances of pain. Animal fat, margarine, other hydrogenated oil, oil-rich seeds other than pecans, buckwheat and nut butters are others to avoid. Use this sequence of points on a daily basis to reduce joint inflammation and increase mobility. Hold the point LI 4 on your right hand. 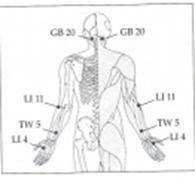 LI 4 is located in the webbing between the thumb and index finger. Move your finger up the webbing (towards the wrist) to the area where the bones meet, then press towards the index finger bone. Hold for several minutes, then hold the same point on the left hand. Hold the point TW 5 on the center of the back of your right wrist. The point is located two and a half fingers up from the wrist crease (under the third finger). Hold for one minute, then hold the same point on the left wrist. Point LI 11 at the right elbow crease. The point is at the end of the elbow crease on the thumb side (hold your palm up). Hold for one minute, then hold the same point on the left arm. Use your thumbs to hold the hollows at the base of the outer skull (GB 20). Hold until you feel a pulse at this point or for at least one minute. Mix fresh carrot juice with equal parts of lemon juice. Take one large teaspoonful everyday. This is one of the best joint pain remedy. In a small glass of warm water mix two teaspoons of apple cider vinegar and 2 teaspoons of honey. Take it twice in a day to get relief. This is good natural remedy for joint pain. Mix two parts pure olive oil and one part of kerosene oil. 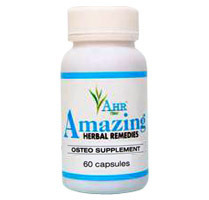 This makes a wonderful ointment for the affected joints and helps in pain relief and is also good joint pain remedy. Warm bath is the highly helpful water treatment for joint pains. One can consume garlic cloves fried in butter for treatment of joint pains and is good Home Remedy for Joint Pain. Exercise amplifies your joint flexibility and also strengthens your bones. Exercise in water can decrease pain and improves flexibility. This entry was posted in Clinic Remedies and tagged Acupressure, Arthritis, Ayurveda, Joint Pain, Joints, Ligaments, Tendons, Yoga.